We go above and beyond to ensure your stay is perfect. We specialize in providing personalized, yet un-intrusive, service. 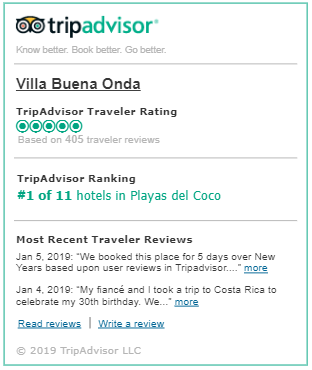 With only 8 rooms the Villa Buena Onda staff is accustomed to, and focused on, providing a memorable experience for all who stay with us. Whether you reserve one of our rooms or the entire villa, we will make your stay unique and unforgettable. We rank #1 in our area on TripAdvisor and are a 4-time “Traveler’s Choice” winner. We also rank among the Top 25 Small Hotels in Central America. We work very, very hard to thrill our guests. Check out our reviews. Well-deserved and special thanks to the entire staff as we can’t say enough about the service from the moment we arrived until we departed. We guarantee your stay will be extraordinary!